We review the card drafting game Fairy Tale from Z-Man Games. 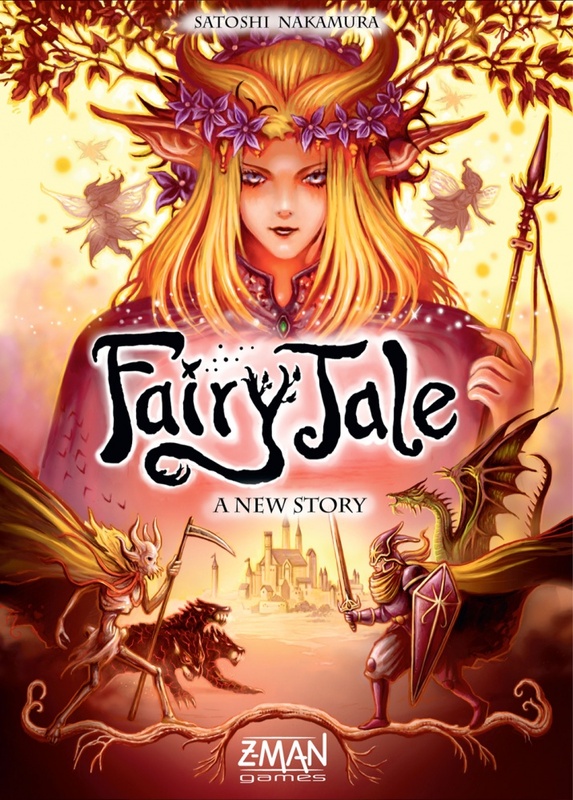 Fairy Tale is an easy to learn card game that has players drafting a hand of cards and then playing a selection of them to try and acquire the most victory points. At the end of 4 rounds, whoever has the most wins. I’m always eager to get my hands on a new card drafting game. I don’t know what it is about that game mechanic that just draws me in, but it’s easily one of my favorites. Perhaps it’s because getting passed a new hand of cards each round gives me a feeling of hope. I’m always excited to see what my new options will be. This is probably why gamers love opening new booster packs of cards for trading card games. It’s like being a kid on Christmas. So when I heard Z-Man Games was going to be reprinting the hard to find card drafting game Fairy Tale, I jumped all over it. 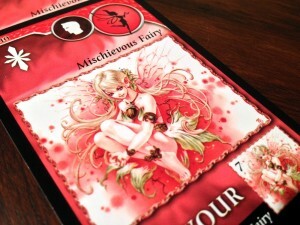 Fairy Tale promised to be an easy to learn card game that is both unique and plays quickly. Does it succeed? Read on to find out! 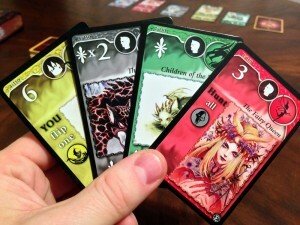 Fairy Tale is a card drafting game for 2-5 players that plays in about 20 minutes. Fairy Tale plays best with 4 players. In Fairy Tale, players are trying to accumulate the most amount of victory points over the course of 4 rounds. Each round is divided into two parts. First, players draft a hand of cards in the standard “pick and pass” fashion. Then, they will select three of those cards to play into their play area. Each card is worth a certain amount of victory points, but many can be increased by utilizing the game’s system of card combinations. Furthermore, many of these cards have actions on them that can cause players to flip or unflip cards they’ve played. At the end of the fourth round, each player totals up their victory points and the player with the most is the winner. The components in Fairy Tale are about what you expect. 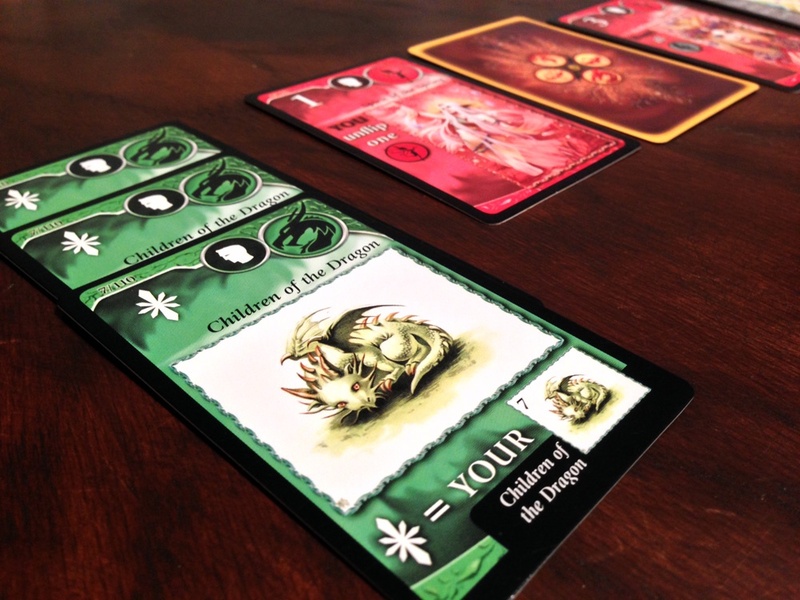 Players get 110 cards to use in the game illustrated with both symbols and thematic art. 30 of these cards are marked to be used with the “expert rules”, which the rule book suggests leaving out until you’ve played once or twice. The artwork in Fairy Tale is really well done. It really fits with the theme of the game. The artwork on the cards is thematic and very well done. It has, as one of our players mentioned, almost a Final Fantasy feel to it. A couple of the images were a little too similar though and can make identifying the card at quick glance a little harder than it should be. But overall the artwork and design on the cards are very well done. Z-Man Games has also cleaned up the iconography in this new version. In the past versions, the card icons weren’t the most intuitive and could sometime lead to confusion. This new version includes more text on the cards so players should have an easier time making decisions without interrupting the flow of the game. Fairy Tale is a very well put together game in a box that’s small enough to be taken on the go. The game play in Fairy Tale is very easy to learn. All the cards are shuffled and each player is dealt out a hand of 5 cards. 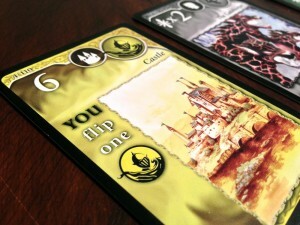 Players then choose one of their 5 cards to keep and pass their hand to their player on their left. With this new hand of 4 cards, players will once again choose a card and pass the rest. Players will repeat this process until they are passed a single card which brings their chosen hand up to 5 cards. At this point, the drafting part of the round is over and players can now choose cards from their hand to play. Each player will simultaneously choose one card from their hand and place it face down in front of them. When everyone is ready, players reveal their card and place it in their play area. The majority of the cards will simply be ways to acquire points. However some cards will have action text on them. Many cards in Fairy Tale have an action, the most common of which is being required to flip or unflip cards. A few possibilities would be: Flip: Either you or every player must flip over a card of the matching color in their play area (if they have one). Unflip: Either you or every player must flip back over (face up) a card of the matching color in their play area (if they have one). Hunt: Any card of the matching color played this time is flipped over. It does not affect previously played cards. Draw: Draw cards from the deck. This doesn’t give you extra cards to play, just extra options of what to play. Flipping cards over causes them to lose their effect and points. So players will want to protect their high point cards by having cheaper cards of the matching color that can be flipped when required. After each player has played 3 cards from their hand, the remaining two cards are discarded face down. Then, 5 more cards are dealt out to each player and a new round begins. Players will play a total of 4 rounds, after which scores are calculated. Many cards will have a face value to what they are worth and some cards will have multipliers. Those cards will increase in value based on how many of them you have (more on that later). Once all players have calculated their victory points, the player with the most is the winner. Some cards have multipliers on them. 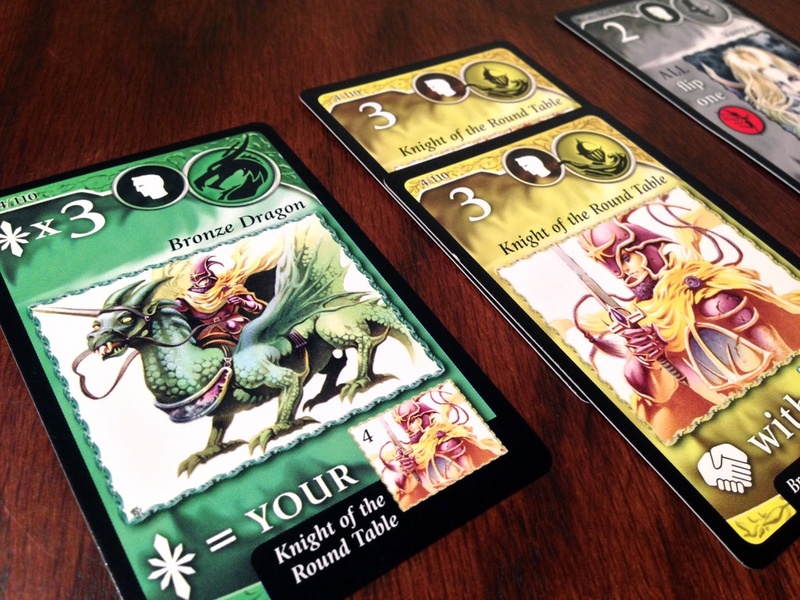 In this example, each of these dragon cards would be worth 3 points (one point per same card). One of the great things about Fairy Tale is how easy it is to get to the table. Other than shuffling the cards, the setup is almost nonexistent. If you are playing with new players, then you can even toss out the 30 expert cards to make for a very quick rules explanation. The only thing that you really need to explain is the flipping rules and the point multipliers. In general though, the expert cards aren’t that confusing. They are easier to understand if you’ve played the game before, but once you use them, you’ll never want to leave them out again. They add a nice bit of variety to the game play that Fairy Tale lacks without them. The expert cards add in the Hunt, Draw 2, and Wild Cards that really add to the game. Fortunately, even if you are playing with new players, the 20 minute play time will make it easy to get a second play in after the learning game. Some cards will work together with others. In this example, the Dragon is worth 3 points, times the number of Knights (the yellow cards next to it) a player has. So the dragon would be worth 6 points. That’s also what makes Fairy Tale such a great filler game. It’s really easy to teach and it plays quickly. Those are both hallmarks of a great filler game. One of the things that make the game so easy to pick up is that there are no payments or resources to keep track of. Players just choose a card and play it. The hardest thing to probably understand is how the multipliers work. Some cards will increase in value for each copy of the card you have. So if you have 3 Homesteader cards, they are each worth 3 points (for a total of 9 points). If you have 4, they are each worth 4 points (for a total of 16 points). I’ve found that people don’t always get that concept right away, but once they understand it, they’ve got the hardest part of Fairy Tale mastered. In Fairy Tale, the fun comes in not only from building out your strategy, but from trying to mess with the other players. You can not only hurt other players by denying them cards during the drafting phase, but you can also utilize the flip and hunt cards to deny them points. I’ve found it to be much easier to flip cards then to unflip them, so having someone turn a high value card of yours face down can be frustrating. But the times when you play an “All Flip Green” card and you see 3 other players lose a high value card is oh so satisfying. I almost wish there were more of those “all flip” cards in the game, they really add a nice bit of player interaction. The game is divided into two parts, a drafting phase and an action phase where players choose three of the cards drafted to play. I mentioned earlier that I think Fairy Tale plays best with 4 players. While the game can accommodate 2 players, it plays a lot different with only two. This is really true of any drafting game. One of the neat things about drafting games is getting an entirely new hand of cards each round. With 4-5 players, you will only ever see your cards once. This keeps things exciting and fresh each time a new hand of cards is passed to you. Fairy Tale does play fine with two players, but I really enjoy the experience of seeing new cards each round. I think with two players Fairy Tale can become a bit more strategic game as you will have an idea of what is coming back to you each round. I really don’t have a lot of bad things to say about Fairy Tale. No, the game isn’t super deep, but for a 20 minute card game that’s OK. I love the quick playing nature of the game and how sometimes you have hard decisions to make. There have been times when I had 5 really good cards in my hand and it was a tough choice as to which 3 to play. Also, choosing the right time to play a Hunt card can be really satisfying when it works out. Fairy Tale ended up being a ton of fun and rarely did we played a game of it and not had someone want to play it again right away. I’m glad Z-Man Games decided to reprint this game as it’s absolutely worth checking out. 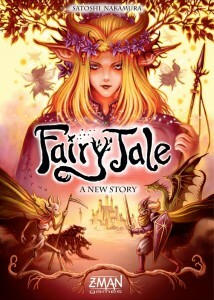 If you are looking for something lighter to open up your gaming night, then check out Fairy Tale. It has a nice blend of accessible rules and very low downtime. Pick up this one today. 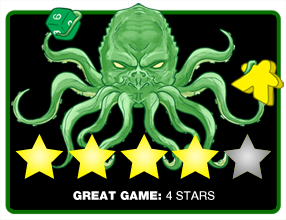 Final Score: 4 Stars – A quick playing, card drafting game. Fairy Tale makes a great filler game and is really well put together.